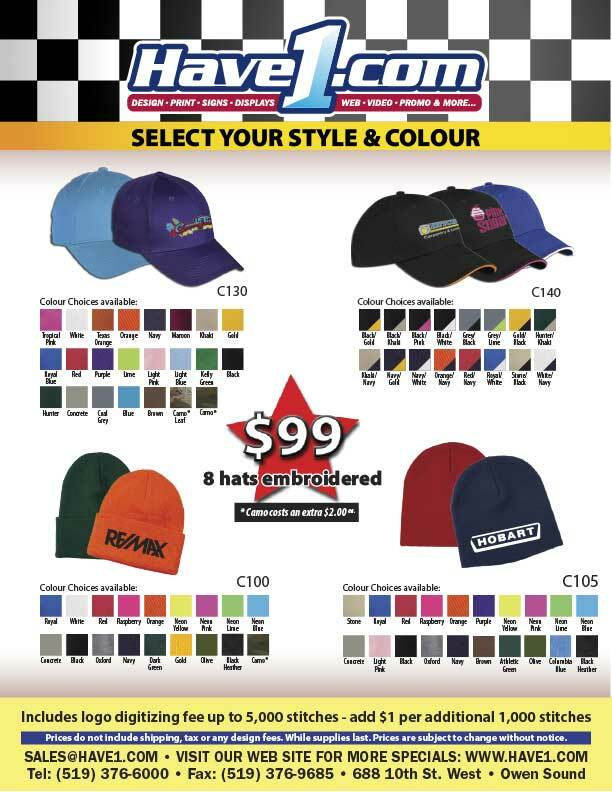 We now provide complete in-house embroidery services on different apparel from hats, shirts, sweatshirts, hoodies, uniforms, aprons, toques, jackets, bags and many other products. Contact us today for a quote on all your embroidery needs. At HAVE1.COM we are proud to offer many different types of apparel, uniforms and promotional products from some of the top quality distributors and manufacturers in Canada. Please visit the following links – if you see a certain product, please note the company’s web site link when you contact us for a quote on your apparel and embroidery needs, that way we can quickly get pricing to you on the exact item you are interested in. All of our embroidery production is completed on-site allowing us to provide great quality results in a very timely manner. Can I supply my own item to be embroidered? Yes you can. Bring it in and we will determine if we can work on it or not. What do I need to get my design embroidered? First of all, you need a logo, or an idea of whatever graphic or text you’re looking to have on your shirt. If you have an image made up already, for a fee we “digitize” your logo, making it into a file made of stitches for our embroidery machine to read. If you want a custom graphic made by us, we also offer graphic design services. We then help you pick out the ideal type of garment to embroider your chosen design to and start on your order. Do you have premade designs or clipart? We make everything unique to the client, so your design will be one of a kind, tailored for you. We prefer vector formats such as .PDF and .EPS, but can also use bitmap formats like .JPG, .PNG, and .TIF files. Higher quality images will allow for more accurate digitization of your logo for embroidery. How much does the embroidery service cost? While this is often the first thing people ask, it’s hard to give a general answer. Every design is different in terms of colours, amount of stitches, and setup / digitizing involved. Feel free to contact us for a quote for the design you want, and we will let you know. Also ask us about our free digitizing specials and local price match guarantee on any of our apparel. Ideally for garment orders above 12 pieces are most economical. Each of these garments can be different sizes & colours – all from the same supplier. Please check our online catalogues via the links listed at the top of this page for different options on apparel. What colours of thread do you have? We have a large variety of colours, and we can show you a sample book should you come in. We try to match thread colours to your logo colours – this also depends on what colour of garment your logo will be embroidered onto. T-Shirts, Team and Company Uniforms, Sponsorship Items and much more. Custom Clothing Transfers Produced directly from your supplied computer artwork files or we can create the artwork for you. Do I need to supply my own shirt? You can either supply the shirt the transfer is to be on or you may purchase it through us. We can order you product in a variety of colours, sizes, and styles. All of our pricing is custom quoted. The cost depends on how detailed the design is, whether or not the clothing is being supplied and more. If I already have a logo, what format works best? We prefer vector formats such as .PDF and .EPS, but can also use bitmap formats such as .JPG, .PNG, and .TIF files. Higher quality graphics will allow for clearer images. We make everything unique to the client, so your design will be one of a kind, tailored for you. Don’t see the product your are looking for? We do fully custom orders in a variety of products. Contact us today with any questions or inquires. Have a look at some of our past projects. Decorating can be done on a wide range of items. Showcasing a variety of transfers and embroidery on hats, shirts, sweaters, bags, and more.